Minimum quantity for "Cable Vulcanizer" is 1. New Macey Cable vulcanizer is a compression molding machine it’s designed to repair cable jacketing where cable splicing has occurred and where cable connectors and or other devices have been added or replace a damaged section of cable. New Macey manufactures portable cable vulcanizers both standard products and to customers specifications for cable repair. Individual cable moulds are machined from Aluminium to any number of standard and custom sizes. 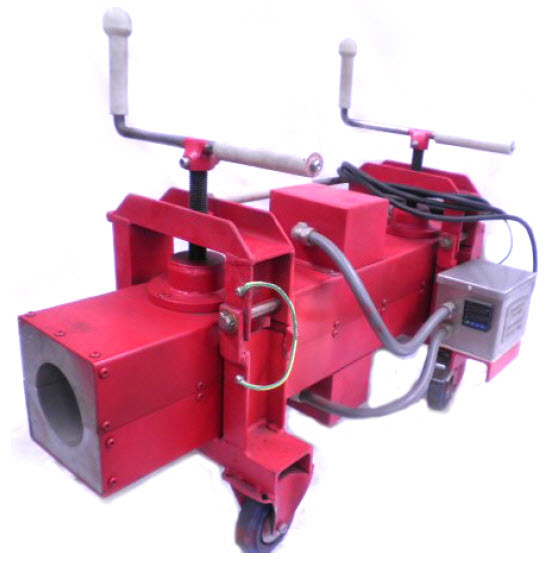 Vulcanizer systems are widely used when a permanent cable splice or Jacket repair is required. New Macey portable cable vulcanizers have solid wheels with stoppers to ensure both ease of movement and stable repair is capable both onsite and within a cable repair worksite. Underground mining presents testing conditions and a harsh environment for both machine and repairers. Within the high voltage cable use in the mining sector wear and tear becomes commonplace. Damaged trailing cables in mining sites result in downtime and schedule losses so a quick on site repair is imperative to reduce costs and keep operational.